Scientists at Penn State University and the Virginia Commonwealth University have discovered a way to produce hydrogen by exposing selected clusters of aluminum atoms to water. The findings are important because they demonstrate that it is the geometries of these aluminum clusters, rather than solely their electronic properties, that govern the proximity of the clusters' exposed active sites. The proximity of the clusters' exposed sites plays an important role in affecting the clusters' reactions with water. The team's findings will be published in the 23 January 2009 issue of the journal Science. "Our previous research suggested that electronic properties govern everything about these aluminum clusters, but this new study shows that it is the arrangement of atoms within the clusters that allows them to split water," said A. Welford Castleman Jr., Eberly Family Distinguished Chair in Science and Evan Pugh Professor in the Penn State Departments of Chemistry and Physics. "Generally, this knowledge might allow us to design new nanoscale catalysts by changing the arrangements of atoms in a cluster. The results could open up a new area of research, not only related to splitting water, but also to breaking the bonds of other molecules, as well." The team, which also includes Penn State graduate students Patrick Roach and Hunter Woodward and Virginia Commonwealth University Professor of Physics Shiv Khanna and postdoctoral associate Arthur Reber, investigated the reactions of water with individual aluminum clusters by combining them under controlled conditions in a custom-designed flow-reactor. They found that a water molecule will bind between two aluminum sites in a cluster as long as one of the sites behaves like a Lewis acid, a positively charged center that wants to accept an electron, and the other behaves like a Lewis base, a negatively charged center that wants to give away an electron. The Lewis-acid aluminum binds to the oxygen in the water and the Lewis-base aluminum dissociates a hydrogen atom. If this process happens a second time with another set of two aluminum sites and a water molecule, then two hydrogen atoms are available, which then can join to become hydrogen gas (H2). The team found that the aluminum clusters react differently when exposed to water, depending on the sizes of the clusters and their unique geometric structures. 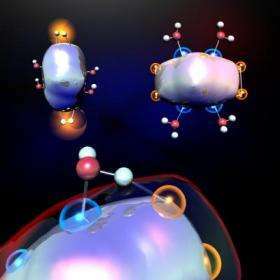 Three of the aluminum clusters produced hydrogen from water at room temperature. "The ability to produce hydrogen at room temperature is significant because it means that we did not use any heat or energy to trigger the reaction," said Khanna. "Traditional techniques for splitting water to produce hydrogen generally require a lot of energy at the time the hydrogen is generated. But our method allows us to produce hydrogen without supplying heat, connecting to a battery, or adding electricity. Once the aluminum clusters are synthesized, they can generate hydrogen on demand without the need to store it." Khanna hopes that the team's findings will pave the way toward investigating how the aluminum clusters can be recycled for continual usage and how the conditions for the release of hydrogen can be controlled. "It looks as though we might be able to come up with ways to remove the hydroxyl group (OH-) that remains attached to the aluminum clusters after they generate hydrogen so that we can reuse the aluminum clusters again and again," he said. The team plans to continue their research with a goal of refining their new method. This research was supported by the Air Force Office of Scientific Research. No catalysis here, so indeed no energy put into this reaction is an overstatement like robbor mentions. We are looking for a catalyst that when we poor water over it, at one end the H2 comes out and on the other end ice? Go and check thermodynamics to find out that this is not possible. Nature still gives nothing for free and probably never will. Oh goodie, now I can fit the equivalent of 15 tons of aluminum in my gastank! The article admits that the resulting OH group needs to been "cleaned" from the aluminum clusters. Yes, and we know how to do that. Aluminium hydroxide is essentially purified bauxite; the article hints at there being some more efficient process to convert purified aluminium hydroxide back into aluminium but doesn't elaborate. And it never will be. It takes energy to split water and that energy comes from oxidizing the aluminium particles. Besides not being reusable, I find it a bit hard to believe the forming of these nano-size shapes from aluminum comes without a huge expense of energy. What would we be buying, energy in/energy out? It's not one of those articles couched in hysteria: "This discovery changes *everything*". (That phrase makes me want to go for the throat, I swear...) But, not being a chemist, doesn't this suggest chemical interaction due to unexpected factors? : "but this new study shows that it is the arrangement of atoms within the clusters that allows them to split water"
The hope is if you can find an energy effcient way to remove the OH- insitu this can used in hydrogen generation. Yes it is a big if, but that is the way new processes are engineered. One step at a time. Is the caption correct when it says "depicts a water molecule (one hydrogen atom (red ball) and two oxygen atoms (silver balls))"? Isn't that reversed, i.e. O is the one red ball and H are the two silver balls?